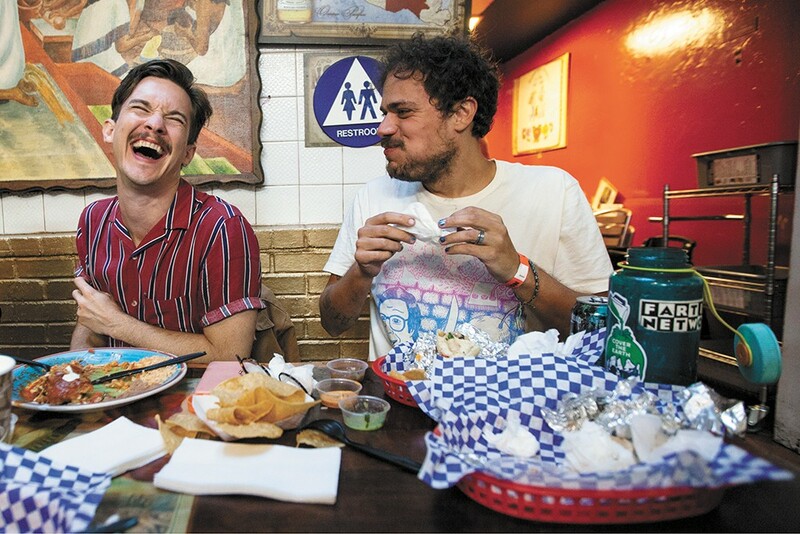 Chris Farren (left) and Jeff Rosenstock are Antarctigo Vespucci, DIY punks making sincere power-pop. In the age of the internet, we've never been more connected to more people, and people have never felt so isolated and alone. It's one of those ideas that's often repeated because it's true: These digital connections feel like empty, frivolous calories without the filling sustenance of real human connection. Now imagine amplifying that dynamic by having a career as a musician who's always on the road. Those kernels of disconnected discontent grew into Love in the Age of E-Mail, the 2018 album by Antarctigo Vespucci, Chris Farren and Jeff Rosenstock's collaborative punky power-pop band. Antarctigo Vespucci formed in 2013 after Farren's band Fake Problems broke up and he was seeking a new creative outlet. He and his pal Rosenstock (then of the DIY punk outfit Bomb the Music Industry!) decided to give collaborative writing a chance, and things clicked pretty instantaneously. "Jeff and I just get together and don't have any pretense for what to do other than the demos I've made, which are often pretty bare-bones," says Farren. "We don't think too much about our other records or what we've already done, we just think about what is fun. ... The main thing is that neither of us are precious about our ideas. "We basically destroy everything and then build it back up. It's at the heart of the project." The end result of all the destruction and reconstruction is the blissful sound of DIY punks sincerely taking a crack at making boisterous pop tunes. Love in the Age of E-Mail never feels forced or irony-drenched, just a collection of catchy-as-hell songs built on power chords. Farren handles most of the vocal duties with an almost aww-shucks sweetness, while effective details differentiate the tracks — be it the lo-fi Casio melancholy of "Voicemail," the starry-eyed glockenspiel-accents of "Kimmy" and "Do It Over," or the clap-along grooves of "White Noise." "Breathless on DVD" is the duo's attempt to crack a Madonna-esque pop jam, while the minor key brooding of "Lifelike" slows down the pace as the album winds down. All the while, the album explores that messy space between truly being on the same page with someone no matter the distance, and the mucky situations where you feel like you're not on the same page with people you love. "The record is about friendships and communication," says Farren. "I think it's understated in a lot of ways how important communication is to friendship. You at least understand that communication is very important in romantic relationships, but I don't think people are talking about it as much [in friendships]. ... I'm still very young, but I'm not in my early 20s anymore. And I feel as you ascend your 20s, the dynamics of your friendships start changing. "Everybody's priorities shift or life just moves people in different directions all the time. It's a constant thought in my head: How do I keep in touch with people? Who do I want to keep in touch with? What friendships are valuable to me and make me feel good? All these crazy friendship questions." To counterbalance the sonic sweetness and deal with the gross uncomfortableness of self-promotion, the friends take the path of humorous hubris when hocking their records. Love in the Time of E-Mail's glorious fake pull-quote reviews include, "'These lyrics contain incredible emotional depth and maturity' — Chris Farren's therapist." "In some way it's a defense," explains Farren. "I'm making fun of myself before anyone else can." 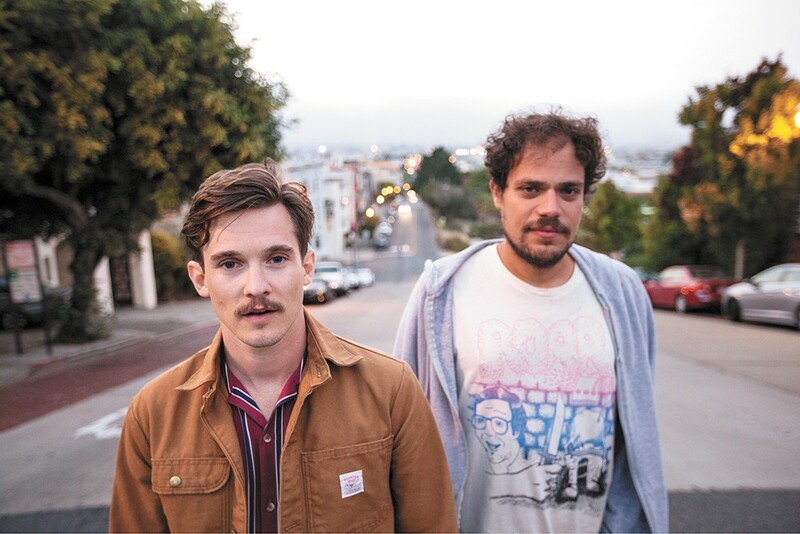 Chris Farren and Jeff Rosenstock. Despite making four records over the years, this will be Antarctigo Vespucci's first West Coast tour. Both Farren and Rosenstock have carved out solo niches, with Farren touring as a one-man band (complete with comedic slideshow accompaniment) while Rosentock broke with the anthemic pop-punk of one of 2018's best albums, POST-. The rarity of Antarctigo Vespucci touring combined with the solo road life make this upcoming run special for Farren. It's not just work; it's "spending two weeks with the people you love." So even when the world seems like a cold and lonely place filled with people in self-created digital cocoons with faces illuminated by screens' glow, at least Farren and Rosenstock have each other. The original print version of this article was headlined "Digital Witnesses"